I wanted to post this aged clipping for some time, but couldn't find it--today, by accident: voila! This is from the now-defunct LA Reader, in its day a competitor to the larger, tabloid-style Weekly. Of the two I thought the Reader's film reviews were superior(at least, at the time--the early 80s); in particular they made a custom of writing capsule reviews of everything that might be screening that week in Los Angeles, somewhat in the vein of the New Yorker. Somewhere--probably the Fox Venice--was showing a program of shorts, and the Reader had raved about the "Red" Tex Avery films, unfortunately assuming that the rotoscope had been used. Well, imagine my dudgeon! As you can see, my writing style was--ouch--even more florid back then. What an egghead! I was thrilled to death that my letter made print. I was working at the Vista theatre at the time(which I discovered was across the street from the studio where the animated feature "Shinbone Alley" was made--but that's another story). The Vista was a fascinating place; it had recently been bought by the owner of the Castro in San Francisco and turned into a revival theatre. As a member of the tiny staff I did everything from run the candy counter to picking films for programming to dropping off checks for prints at Buena Vista--where I'd use the opportunity to drop by the Disney Archives. In the course of my job I somehow wound up driving cult director Paul Morrissey home from a screening of "Andy Warhol's Frankenstein(3D)". I wouldn't have picked him out as the director of that in a million years. Nice man. 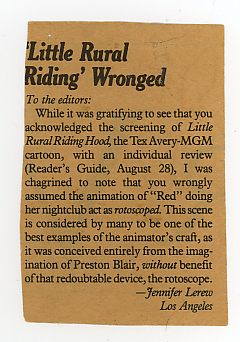 And by the way, in my letter--just because it still rankles 24 years later--there's a typo: it should read "...doing her nightclub act was rotoscoped". rather than "as" rotoscoped". Ah, but you did your job! Way to go! I've been in print several times for righting several wrongs, most of 'em regarding animation. The most recent being one where I got onto the writer for assuming that the animation in "Life Aquatic" was computer generated, when in fact, it was stop-motion. Infidels!